1078, 10 BE 78 in RMP service. On the Austin Champ can be seen the RMP marking on the bonnet, which Captain Floweth mentions in the Legend article, but the signs do not show up well and many RMP Austin Champs have the same RMP signs as on the Jeeps behind. 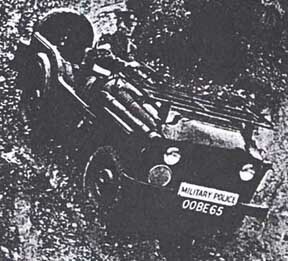 In the following photo of 0065, 00 BE 65 shows an often-used position for the Military Police sign. The following in-service recollections of RMP service. 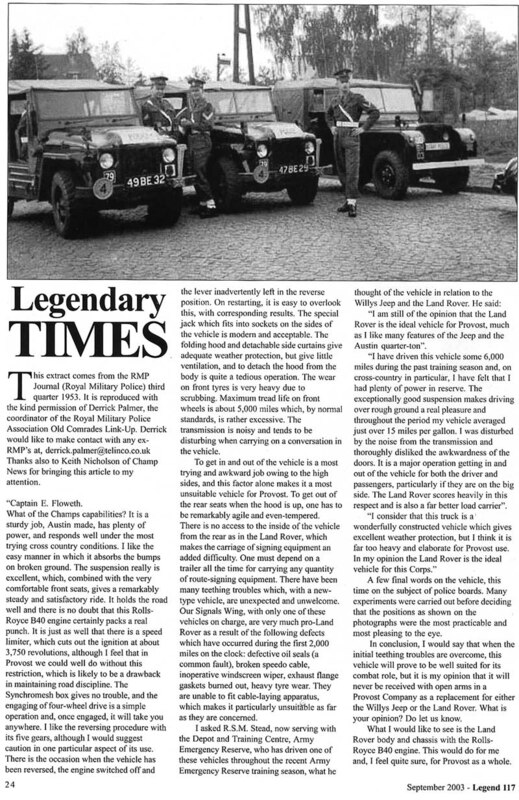 I recall Austin-Champs being used by the Military Police, 247 Provo Company, Berlin in 1954/55. I have found two photographs showing that at least three vehicles were used by the company for general police duties including patrols on the Berlin-Russian Zone border. The registration numbers are shown as 10 BE 78. 47 BE 29, 49 BE 29. The Champs were used by us for general use and border patrols. The line of vehicles (lower picture) is at the Berlin zone check point from Hamburg(? ), waiting to meet a bus load of Army 'Top Brass' (Generals), but for what reason I cannot remember! Sometime in 1954/55. 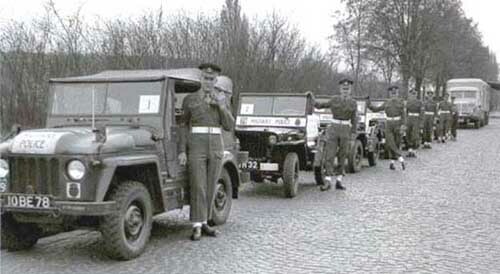 I think due to the fact that Berlin was controlled by the four powers, the Military Police were issued with green Canadian style uniform and the vehicles were painted black rather than military green. Looking at the photographs it appears 10 BE 78 is shown as green (was it there on test?) whereas the other two are painted black. I cannot recall too much about them other than the Rolls Royce engine was huge, completely filling the engine compartment making it difficult for the mechanics and also front heavy. The first British troops arrived in Berlin on 4/7/45. They were organised as British Troops in Berlin [BTB], then renamed the Berlin Brigade and later still, the Berlin Force. They were not part of NATO, but were the UK contingent required under the 1945 Berlin Treaty. It was made up of three infantry battalions with supporting troops and HQ. The 247th [Berlin] Provost Company was based at Lancaster House in Fehrbelliner from 1945 to 54, then moved to the former German Sports Forum in Olympia Station. [i] WN1-1078, 10 BE 78, Eng: 1430, DiS (Date into Service): 21/11/52 under RV (Receipt Voucher): LHM/R/5691 and S/O (Struck Off) BAOR on 31/3/64. [ii] WN1-4932, 49 BE 29, Eng: 52911, DiS: 10 Dec 1953, RV: LUD/R/35, S/O: BAOR 31 Aug 1956. The RMPs must have crashed it! [iii] WN1-4729, 47 BE 29, Eng: 52605, DiS: 25/11/53 under RV: CBR/R/53, S/O: Allies BAOR 30/6/64. Was used by NATO Allies. The RMP (Royal Military Police) in Berlin used the Berlin Brigade sign with 79 on black [1951-59] and then 28 on black. I have a poor copy of a photo taken on 9/6/55 during the queen's birthday parade in Olympia Station. It shows four Champs, which are LHD because the photo has been printed reversed! I have another dated 29/5/53 showing RMP Jeeps with double wire cutters [anti-decapitation] fitted and a spot lamp on a stand in the back.